It's about progress, connections, understanding within and without, respects diversity IDIC ( I'm a Gay male), it questions, expands the mind, opens possibilities and offers hope. It calls attention to human dignity and that we can be more than what we are. For me personally it alleviated many a painful day. At around age 7 back seeing TOS reruns past my bed time I was literally sucked into the star field. I escaped into better realities. It connected me with two boyfriends and over 200 pen pals world wide. 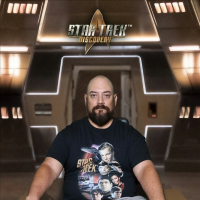 Some of my happiest moments have been at conventions, and recently meeting the Discovery cast at STLV18 and meeting wonderful loving fans, is yet another life highlight. Gene Roddenberry's production company reviewed my novel: Eclipsia, Dignity Must Be Returned for all, Barnes & Noble online in 2009, no greater honor could be bestowed a first time writer! If interested I can send you a download. I also run Star Trek Pen Pals on facebook, please join. Being a Trekkie and part of something so grand, a vision of progress, is wonderful and connects us really to outstanding people and makes for instant friendships. I love every facet of the series, from music, to costumes, to adventures, to mysteries, to tech, to design, to symbols, to the ideals. Live Long and Prosper. -Robert.